NEW DELHI:Bengaluru reception done.Deepika Padukone and Ranveer Singh touched down in Mumbai on Thursday evening with the Bhavnanis in tow. Setting major couple goals and fashion goals too, the newlyweds were spotted in colour coordinated outfits designed by none other than their designated wedding couturier Sabyasachi. The couple added one more set of stunning outfits to their airport diaries as they walked out of the gates in head-turning pieces in pale pink – he wore a kurta with embroidered neckline while she opted for a flowy anarkali with a self-worked dupatta. The couple also wore coordinated tan jootis with gold embroidery to complete the airport look. Unlike other times, the couple quickly made their way to the car trough the flocking paparazzi. Deepika Padukone, who has worn her hair in a bun for all of her public appearances so far, made no exception for her airport look and accessorised with heavy danglers and her gorgeous smile! 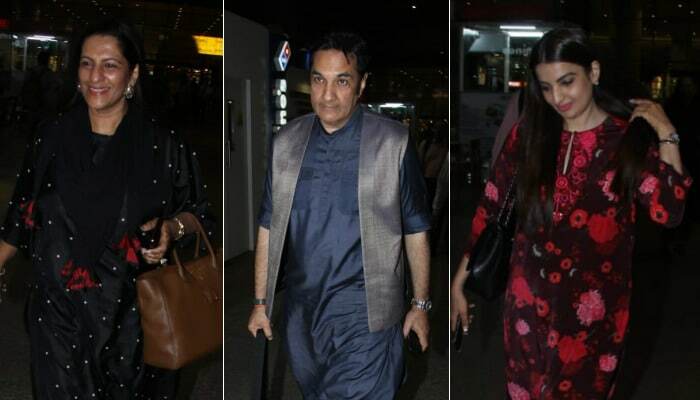 Ranveer’s family – mother Anju Bhanvani, father Jagjit Singh Bhavnani and sister Ritika – were also spotted at the Bengaluru airport. Deepika and Ranveer’s first wedding reception concluded in the actress’ hometown in Bengaluru on Wednesday. While Ranveer and the Bhavnanis opted for Rohit Bal creations, Deepika wore a saree gifted to her by her mother from the Angadi Galleria. She was styled by Sabyasachi. Meanwhile, here are all the times the couple were at the top their wardrobe coordination game! They left for Italy on November 10 and touched back in Mumbai on November 18. They took off for Bengaluru on Tuesday and are back in Mumbai now. Deepika Padukone and Ranveer Singh are expected to host a wedding reception in Mumbai on November 28 and a party later on December 1. The couple had a dreamy destination wedding in Italy’s Lake Como on November 14 and November 15. Related Items:Bengaluru, celebrity, Deepika, featured, Ranveer, reception, Sabyasachi.